Eleni Era originally is from a village in Cyprus and left the island at the age of 18 to study piano in Berlin, where she lives and works since. She returned to Cyprus to record Rise Love, the collection of songs she wrote next to her professional work as pianist and conductor of a choir. The result is an album that pays homage to her roots as plays well into western pop music of the more serious nature. Not more than once I hear the influence of Kate Bush come by but also Massive Attack and several atmospheric artist that, in my ears, do not produce music as I know/prefer it. On Rise Love it is an undercurrent mixed into the songs of Eleni Era. The result is all sorts of sounds that move under, through and over her songs, creating an extra layer to listen to. Rise Love is the sort of album that allows me to sit back and be washed over by the music. All rush is gone. What remains is private time between me and Eleni Era's music and voice. The opportunity to listen to the many details on Rise Love. Details that make the album so interesting. The album hangs somewhere in between the past and the present. The sounds are often very modern, the production spacious. The mood of the album could have been created in the late 70s or mid 90s. Both in the U.K. though. A mood that has something mystical, as if there is more between heaven and earth. Listen to 'Not Her'. A song about personal change, but also as if the worldly presence of the body has just been left behind by the soul or spirit. The accompaniment sounds so fleeting, almost see-through transparent. (Not a little I'm remembered of Elenne May by this song. Come play in NL and this band should be the support act.) The mix of the little bells and atmospheric sounds create something special. 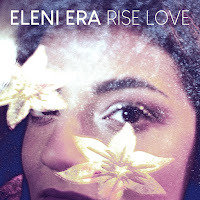 Listen to Rise Love and you will find several songs that work in this way, while others are more based around the piano of Eleni Era, so somewhat more traditional in sound. That is only where the story starts. Also here the songs have something special. Nothing is straightforward or simplified for the convenience of the listener. The percussion is always different from a regular pop album. The atmospherics make it different in sound and always a hint at modern electronics and beats could be involved. The exotic sounding Greek in 'Rain' and 'Beautiful Sunshine' makes it the more different but just as relevant musically. It all makes Rise Love more special. On Rise Love there is a lot to discover. Eleni Era is a talent who is able to combine, 70s pop, 90s triphop and her classical training into something sounding like herself. With her high sounding voice she delicately brings her work to the listener, who in my opinion should give the album a well deserved chance.